Whether it’s your first quad or you’re a seasoned builder, there’s always the potential that something will go wrong. You’ve armed and found that your quad powers on, props spins up, but won’t take off. The flight controller software needs to be told a lot about its setup and the environment to work properly. When these things don’t line up with reality, the quad goes in the wrong direction. It starts trying to correct for this, causing it to even more forcefully go the wrong way. This causes a complete flip-out as soon as you try to move. 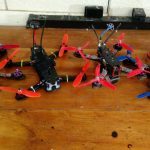 If you are running a recent version of Betaflight, your quad may refuse to lift off instead of flipping out. Betaflight now attempts to detect when the quad isn’t acting appropriately to your input and will quickly shut it down. This is much safer! If Betaflight killed your quad for this reason, you will see the “RUNAWAY” status warning on your OSD. Not all of the problems that can cause a flip-out are caught by runaway protection, but the steps you take to fix that problem are the same. There are a lot of reasons this can happen. Today, you’ll learn how to fix this common but frustrating problem. When troubleshooting this issue, once you’ve confirmed that the props were installed properly, the next thing you must do is take them off. When a quad spins up but the user doesn’t have complete control, it creates a dangerous situation. No good will come of trying to debug this issue with props still attached. Are your propellers installed correctly? Make sure your props are all right-side up. There is almost always some raised writing on the prop, which should be installed on the top. If not, look for a subtle “C”-shape to the blades. The opening of the “C” should point downward. White dots indicate the “high” side of this prop. Note the subtle “C” shape to the blade. Make sure all of your props are facing the right direction. The arrow on the diagram should point from the low side to the high side of the blade. In other words, if the motors were spinning in the direction shown, the high side would catch the air first. If your prop is right-side up but pointing the wrong way, you need to switch it for a prop of the opposite direction. Props come in both clockwise (CW) and counter-clockwise (CCW, often marked with “R”) types. Your quad must use two of each kind. In rare cases, you might be running a reversed “props-out” configuration. If that’s true, all of your props should be the exact opposite. You will still use two of each kind, and they should be installed right-side up. 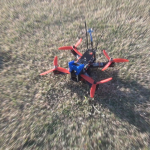 When Crash-Flip mode (also known as “Anti-turtle” or just “Turtle” mode) is on, the quad behaves very differently. If your quad does not respond to throttle but flips out when you touch pitch or roll, this is probably your issue. “CRASH FLIP” in your OSD status also indicates this. 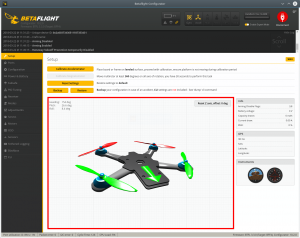 Visit the Modes tab in Betaflight. Make sure Crash-Flip mode is disabled, or set so that it is not switched on while your radio is powered up. 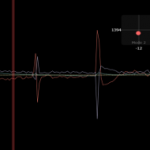 Are the motors spinning the correct direction? Before checking this, remember: PROPS OFF! 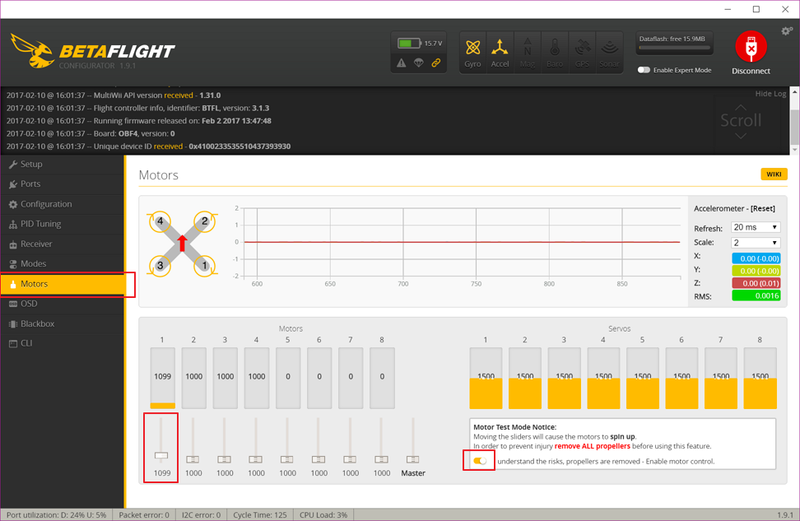 Plug in a battery and use the “Motors” tab in Betaflight to spin up your motors. Each should be spinning according to the diagram. Motors spin at such a fast rate that it can be hard to see which direction they are moving. You can use your finger to lightly touch the motor bell and feel the direction it’s moving in. This won’t hurt it; normally you have props attached and the motors have to spin under load. If any motor is working opposite what you want, you need to change it. You can do this by desoldering and switching any two wires between the motor and the ESC. For most quads these days, there’s a simpler approach: adjust the motor direction setting in BLHeli. Your can read about how to do that in our article, How to configure your BLHeli ESCs. Betaflight needs to know which motor direction you are running (standard vs. “props-out”). 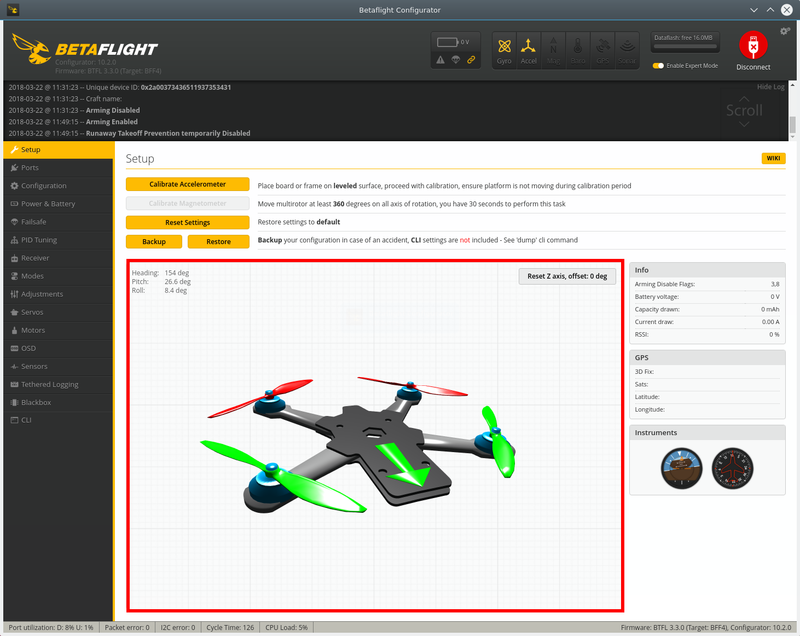 The command you use will depend on the Betaflight version. Make sure the commands you use match the motor direction you have! For very recent versions of Betaflight Configurator, there’s a switch on the “Configuration” page to easily check this instead of the CLI commands below. For a typical configuration, you should see “OFF” (or “1”). If not, then run the command “set YAW_MOTORS_REVERSED=OFF” or “set YAW_MOTOR_DIRECTION=1”. For a reversed, “props-out” configuration, you should see “ON” (or -1). If not, then run the command “set YAW_MOTORS_REVERSED=ON” or “set YAW_MOTOR_DIRECTION=-1”. If the flight controller doesn’t know which direction it’s pointed relative to the motors, it’ll make incorrect corrections that cause a flip-out. Connect to Betaflight. You should be in the “Setup” tab by default. The green arrow matches the direction your camera is facing. Tilt your quad left, right, forward and back. If the pictured quad does not follow your movements, adjust the “Board and Sensor Alignment” in the Configuration tab. Most likely, you will need to change the Yaw by 90 degrees one way or the other. A poorly calibrated ACC causes the flight controller to think it is angled incorrectly, which can cause it to constantly try to flip over. Disabling the Accelerometer in the Configuration tab will also resolve this issue, but it will prevent you from using stabilized flight modes like Angle and Horizon. The mixer tells the quad which motors to spin in order to get the craft to angle in the right direction. This is set in the “Configuration” tab. It should always be set to “Quad X” unless you’re running an unusual motor configuration (such as a tricopter, hex, or “plus” layout). If your quad flew perfectly and you haven’t changed any parts or settings, there’s a chance that some component has gone bad. 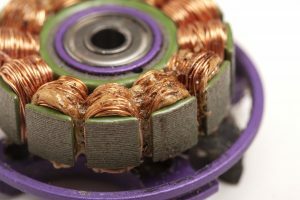 The enamel on these windings melted, shorting them together and causing the motor to fail. 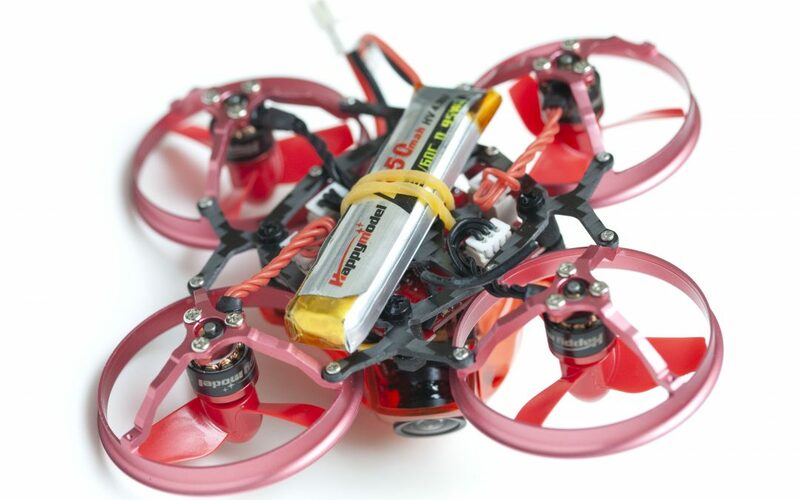 A dead motor or ESC will cause the quad to flip on takeoff. Flipping toward the same direction every time often indicates this problem; a poorly performing component doesn’t provide thrust and ends up being the “low” side when you apply power. Inspect these components carefully to see if there’s any sign of damage, and replace them if necessary. If the angle of the quad in the Setup tab is wrong and recalibrating doesn’t help, (or doesn’t stick,) you probably have a bad Accelerometer. You can disable the ACC entirely in the Configuration tab, but stabilized flight modes like Angle and Horizon won’t work anymore. However, you can still fly this quad as long as you only use rate mode. Most serious racers and freestylers do this anyway, and it’s a great skill to learn. If quad in the Setup tab is behaving erratically or constantly spinning, you probably have a bad gyro. 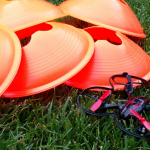 Unplug and plug your quad back in just to make sure; the gyro should recalibrate each time you power up. If the issue persists, you will likely need to replace your flight controller. Quadcopter software setup – Betaflight Configurator guide! LiPo storage voltage - how much does it matter?